Why yes, I am a bit of a scaredy cat. Last night we went to a local carnival. That’s right, the outdoor type where you can buy bad food and spend an arm and a leg on a 2 minute ride built in haste, with loose bolts, and makes most people cringe at the mere mention. 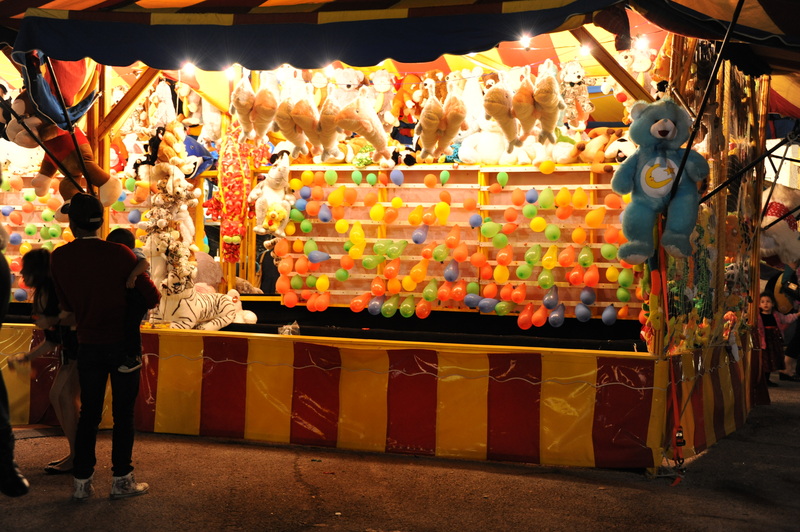 The same type of carnival that growing up would draw our small town residents to try the rides, spend $20 trying to win a 2 liter soda and a stuffed animal. It seems so quaint, but really it’s just a bright and shiny distraction which is just right for the likes of our 3-year-old. I remembered that I have an irrational fear of heights. 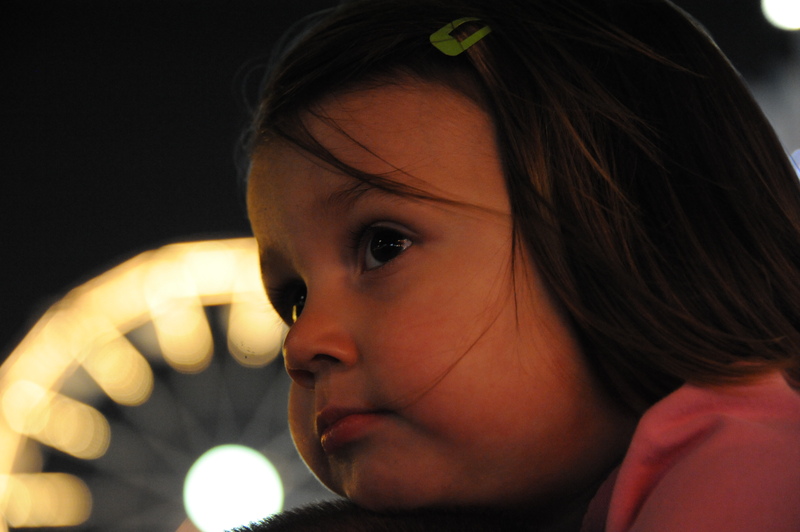 I went on the Ferris Wheel with my daughter. Instant panic attack. Not the panic attack of what if the bolts come loose and we plunge to our death 20 feet below, just the utter terror of being lifted high in the sky. If I hadn’t felt the need to put on a brave face for my daughter, I might have run the risk of total humiliation by requesting I be let off immediately. While on the ground waiting our turn to get on the Ferris Wheel, I had every intention of taking some nice aerial shots with my camera. Not happening. No way was I letting go of that center pole. I can pretend everything’s ok while I focus on my breathing for the sake of my child, but I refuse to let go of my grip on that pole. Yes, I know that if I plunge to our death, that pole will do nothing for me. Oh well. I get paranoid when taking photographs in public. I’m no professional. I just like to take pictures. I mostly like to take pictures of my daughter, but sometimes, I want to take pictures of people. But I get scared. What if they get offended? What if my camera gets stolen? If you read the tribute to love, you know that this isn’t the first time this thought has occurred to me. What if they realize I’m not a professional photographer? The secret is out. Will I be stoned? Or worse, what if people laugh at me. THE HORROR! Just a little bit of drama. Much like my irrational fear of heights, this is my irrational fear of people figuring out that I’m secretly insecure. There’s no pole to hang on to though. Deep breath. Let go of the pole – it won’t really save you. PS. My irrational fears cause my ability to recognize people to falter. Again, I’ve seen this happen before. This time I didn’t recognize my neighbors. Standing 2 feet away from me. Staring at me. Giving me the are you serious look. My bad.